If you're looking for a romantic bolt-hole by the coast where you can cosy-up with your love, there is no better destination than North Cornwall. 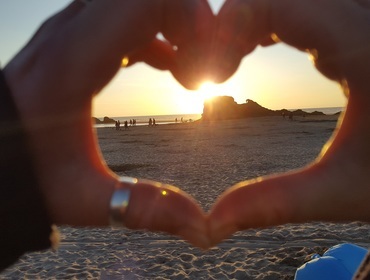 Whisk your valentine off for a stay in one of our cosy Cornish cottages or luxurious holiday homes on February 14th and make the most of North Cornwall's quiet beaches, superb cliff top walks, stunning sunsets and awe-inspiring ocean views. Nothing beats a romantic coastal walk strolling hand-in-hand along sandy beaches followed by a hot chocolate, or maybe some salty fish and chips. Wrap up warm to head out on a clifftop hike and curl up together afterwards beside a roaring fire. Or why not brave the elements and try something new together like surfing, windsurfing or stand up paddleboarding? Afterwards you can book into a spa to relax in a sauna and steam room to warm up from the winter waves. Catch the ferry over to Padstow for a delicious dinner or head into Rock, Polzeath or Port Isaac for some inspiring local food. February really is a great time to visit Cornwall and with buckets of fresh sea air, it's the perfect time of year to blow away the winter blues!